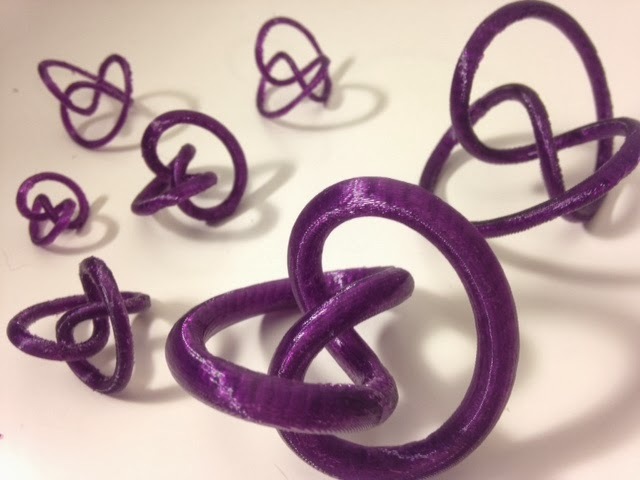 Today's print is a knot with a special property: No matter how the knot sits on the table, it never touches the table in more than two places. This property makes the knot rock back and forth easily, and roll down even very shallow inclines. It's a fun thing to have on your desk, and it's the knot that I usually print at demos and talks. Settings: Custom MakerWare profile to control the supports and how they attach to the models; see below for details. The knots in the picture were printed at 50%, 25%, and 15% scale from the STL files above. The parametric equation in this code comes from Morton's paper Trefoil Knots Without Tritangent Planes, Bull. London Math Soc. 23 (1991), 78-80. Changing 0.25 to 0.15 in "Tube" creates the thinner model. The "+.01" at the end of the t-range is to make sure that the knot connects back to itself again when it closes the loop. If you take that part out then you will be able to pull apart the model in that spot, which is useful if you want to put the knot around something but not so useful if you don't want your model to look a little broken. Action video! Note that the very slight incline of the closed laptop is enough to make these knots roll. UDPATE: You can now order a print of this model from Shapeways at the new Geekhaus store.